Hello Linux Geeksters. As you may know, Rubyripper is an audio music ripper, using cdparanoia for correcting errors. The latest version available is RubyRipper 0.6.2, which has recently received support for Ubuntu 14.04. 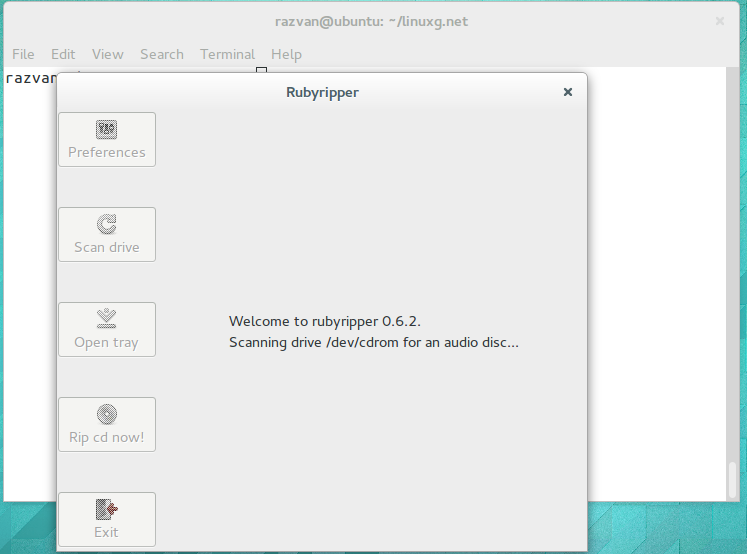 In this article I will show you how to install RubyRipper 0.6.2 on Ubuntu 14.04 Trusty Tahr, Ubuntu 13.10 Saucy Salamander, Ubuntu 12.10 Quantal Quetzal, Ubuntu 12.04 Precise Pangolin, Linux Mint 17 Qiana, Linux Mint 16 Petra, Linux Mint 14 Nadia, Linux Mint 13 Maya, Elementary OS 0.2 Luna and their derivative systems. Because it is available via the GetDeb PPA, installing RubyRipper 0.6.2 on Ubuntu, Linux Mint and Elementary OS is easy. Follow the instructions for your system exactly, in order to get a successful installation. Otherwise, very useful, thank you.